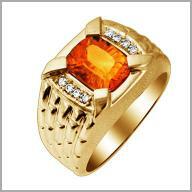 14K yellow gold Men's 2.3000ctw Madiera Citrine & 0.06ctw diamonds Ring. A radiant style that oozes confidence and attitude! Designed in 14K yellow gold, this ring gleams with a raised profile of the centerstone with one rectangle cushion shaped full cut 9 x 7mm Madeira Citrine in four prong setting. Adding sparkling splashes are 8 round full cut diamonds in beads settings. The ring have a links design going down the shoulders.